We spent the morning in Frankfort lounging by the pool and hot tub waiting for the ac pump to arrive. When it hadn't arrived by 11, we went for a nice walk by the beach and down some more side streets to admire the beautiful Victorian homes. When the ac pump finally arrived around 3pm, we started out on the journey to Charlevoix. The photo to the left shows Frankfort from the harbor. As we left the channel, we found the lake to be pretty rough for our 75 mile day. But when we rounded the corner of Pyramid Point, Ben declared he found his new favorite place on earth, a place we anchored for lunch to take refuge from the rough waters. It was gorgeous with tall sand dunes and crystal clear turquoise water that resembled something in the Bahamas instead of Lake Michigan! 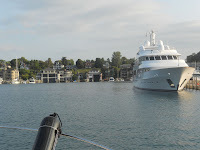 We knew Charlevoix was going to be a magical place as soon as we entered the channel and spotted one of the Four Winns founders (or.. the godfather.. as Ben refers to him) homes & boathouse. 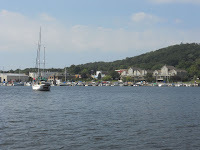 We found the municipal marina easily and choose a dock right next to the park. After tying up in slip #56, we changed our clothes, cleaned up a bit and walked down Main street before settling in at the Village Pub. It was a cute, cozy little place and looked like it was full of regulars. I had the whitefish and Ben had a rueben, a great meal to end a long day! Right now we're relaxing on the boat, listening to the rain, and a karaoke bar across the street where everyone singing actually sounds good, and we are in heaven! Across from us, we can see the lights of downtown, the tree's lit with strands of light blue, and the old-stlye streetlamps illuminating the park. Down the way a bit towards the boaters lounge, we can see kids playing in the fountain and people walking around admiring the boats. After our very rough day on the lake with 3-4 foot waves, but that sure beats the 6-7 foot waves and water spouts in tomorrows marine forcast, so we are very grateful for the 3 days of relaxation ahead of us here in Charlevoix. More to come about the wonderful city of Charlevoix tommorow! !